Here, Home, Hope by author Kaira Rouda is the fictional story of one woman's courageous journey through midlife crisis and personal reinvention - all told with a sense of heart and humor. 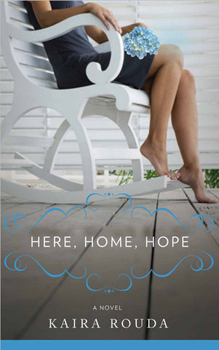 Here, Home, Hope will surely appeal to readers of chick lit and other women’s fiction titles who are ready to transition into something new in their own life. Visit KairaRouda.com to learn more about the author on her bio page and read more about the novel here. Kaira is currently on a national book tour - check out the schedule to see if she's coming to your area. Thank you to One2One for providing this book for me to review. I'm always looking for good books to read. Especially now as I have a Kindle I can easily carry them around with me. Thanks for the review, Jamaise! I'd love it if you'd follow me on my new blog. www.feralmoon.com !